Fine autumn weather— Clear skies, warm sunshine— And wonderful cool breezes from the south— A calm quietness has settled over all things. The odor of burning leaves— What intoxication it contains! The exhibition From Nature focuses on Burchfield’s nature studies and paintings in which certain flowers and trees are central. His naturalist temperament resulted in beautiful studies that concentrate on landscape details. Some of his depictions of wildflowers rival illustrations made by John James Audubon, the Prestele family, James Vick and others who documented plants, birds and insects from both scientific and artistic perspectives. 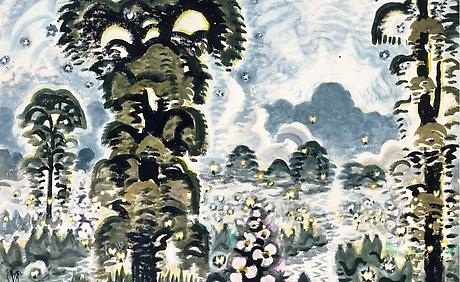 Burchfield, however, usually transposed his botanical studies into more interpretive paintings that expressed his profound appreciation of nature. The exhibition includes watercolors from the Burchfield Penney’s collection, as well as drawings and wallpaper studies from the Charles E. Burchfield Archives that have never been shown before. In addition, several private collectors are lending works for a rare public appearance.